TORONTO, ONTARIO--(Marketwired - Dec. 1, 2014) - Cordoba Minerals Corp. (TSX VENTURE:CDB) ("Cordoba" or the "Company") is pleased to announce that the current diamond drilling program at the San Matias Copper-Gold Project has identified large widths of high-grade copper-gold mineralization in a newly discovered zone that is the interpreted southern extensions to the Montiel East prospect. A preliminary diamond drilling program has also defined broad zones of porphyry copper-gold mineralization at the Costa Azul prospect and porphyry-associated copper-gold mineralization at the Montiel West prospect. To date the diamond drilling program has located high grade zones of copper-gold mineralization at all of the tested targets in the northernmost 3 km of the San Matias Copper-Gold Project. Surface sampling of the remaining 10 km of strike length has identified numerous additional targets for potential drilling in 2015. "Cordoba's 2014 diamond drilling program at San Matias has successfully identified and intersected near surface high grade copper-gold mineralization at its Montiel and Costa Azul targets with the potential to significantly expand the discoveries with additional diamond drilling. 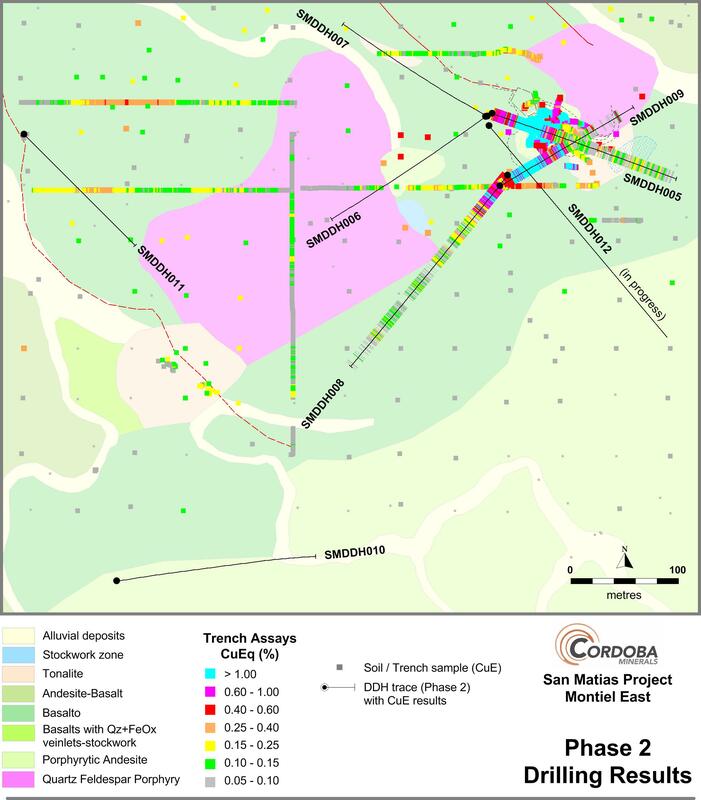 The San Matias Project continues to grow on a district scale as numerous additional targets have been identified," commented Mario Stifano, President and CEO of Cordoba. "The highly prospective San Matias Project has the potential to host large open-pit style copper-gold deposits in a region that is near existing infrastructure and operating open pit mines, making this one of the leading and most exciting exploration projects in Colombia." Follow-up diamond drilling at the Montiel East target has focused on better defining the morphology of the high-grade porphyry copper-gold mineralization and testing of the newly discovered extensions from recent RAB drilling. The diamond drilling has located significant extensions to the copper-gold mineralization to the south of the previously drilled area and also located large volumes of various porphyry phases that are not evident in outcrop, greatly increasing the size of the target, due to it dipping to the south and south-east under what appears to be structurally emplaced mafic volcanic country rocks (Figure 1). The porphyry copper-gold mineralized phase is associated with a series of porphyry dyke and sill-like intrusives of varying phases and incorporates both sheeted and stockwork quartz-magnetite-chalcopyrite-bornite veins within strongly potassic altered diorite porphyry. Diamond drilling is on-going to better define the extent of the porphyry mineralization given the newly discovered extensions with additional assays pending. Minor copper-gold mineralization is also hosted within the mafic and intermediate volcanic hostrocks as multi-directional quartz-magnetite-chalcopyrite-bornite veins which are adjacent to porphyry margins. RAB drilling to the south of the previously defined limits of known copper-gold mineralization at Montiel East was successful at locating a zone of mineralized porphyry that is interpreted to be the southern extension (Figure 2). 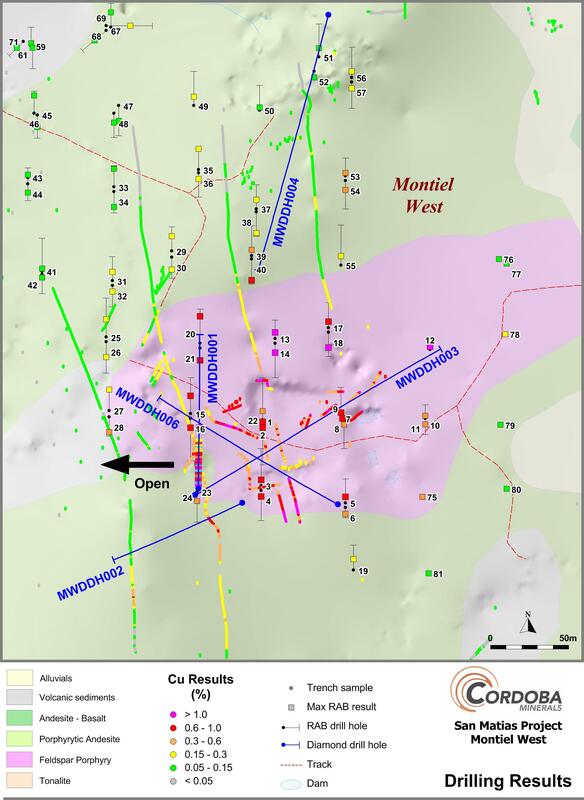 Preliminary diamond drilling at the Costa Azul target has successfully intersected large widths of copper-gold mineralization associated with diorite porphyry intrusions that occur as a series of sub-parallel dykes and intrusive bodies within mafic volcanic country rocks (Figure 3). Copper-gold mineralization at Costa Azul is associated with quartz-magnetite-chalcopyrite-pyrite-bornite sheeted and stockwork veining, both within diorite porphyry and mafic volcanic wallrocks. The mineralization remains open to the west and north, where an E-W fault appears to truncate the mineralization but potentially remains open at depth. A follow-up ground magnetic survey will be conducted over the known extensions to better define the depth extensions and fault offset porphyry mineralization prior to deeper drilling. 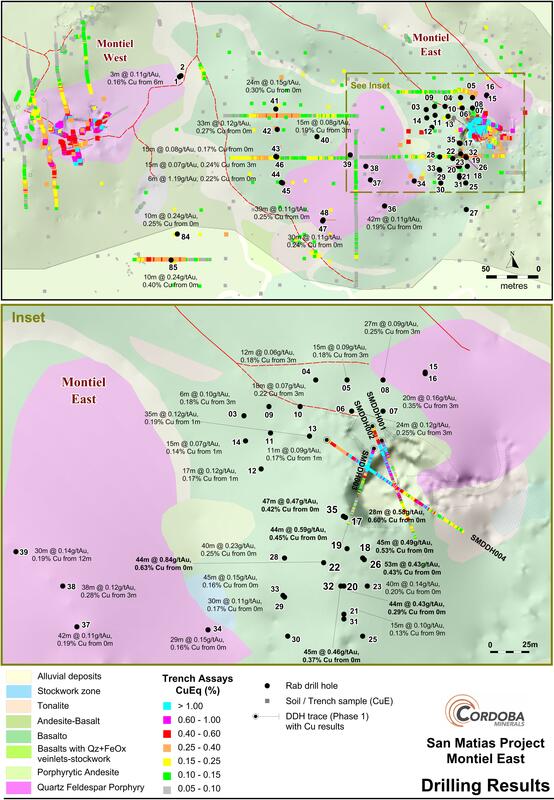 Preliminary diamond drilling at the Montiel West target has intersected zones of multi-directional sheeted quartz-magnetite-chalcopyrite-bornite veins that are hosted in both mafic and intermediate volcanic rocks (Figure 4). This style of copper-gold mineralization is interpreted to be porphyry-related, as seen at both the Montiel East and Costa Azul prospects, where it occurs immediately adjacent to the mineralized porphyry intrusives. Drilling however has yet to locate the associated porphyry intrusive and the defined mineralization remains open to the west where ongoing diamond drilling will test this extension. A follow-up detailed ground magnetic survey will be conducted over the known mineralization and defined extensions to locate any associated porphyry intrusives. A number of drillholes are awaiting assay. Surface sampling, incorporating stream sediment and soil auger sampling programs, along with detailed geological mapping, is well advanced along the unexplored 8 kilometres of strike of the main porphyry corridor in the southern parts of the San Matias project tenure. The main porphyry trend is defined by a 13 kilometre long linear north-south trending structural corridor that hosts multiple intrusive porphyry centres, as defined by the airborne magnetics (Figure 5) and displays extensive zones of surface gold-copper-silver anomalism. The ongoing sampling program along this trend has rapidly defined a number of new prospects and targets that are currently undergoing detailed geological mapping and soil sampling and are related to both porphyry-style mineralization and alteration halos over large areas (Betesta, Costa Rica, Nieves). Significant gold-copper-silver in-soil anomalies have been defined within these targets to date and infill sampling is ongoing. Additionally, both high-grade gold targets associated with quartz-pyrrhotite-chalcopyrite veining over significant strike lengths of +500m are associated with zones of artisanal open-pit and underground mining at the Mina Ra and Escondida targets that also host porphyry style alteration halos in adjacent host rocks. Furthermore skarn/replacement style mineralization and alteration has also been located at the Buenos Aires and Botero targets. Active ongoing exploration with multiple field crews is expected to advance all of these targets in the near-term for additional drilling programs in 2015. 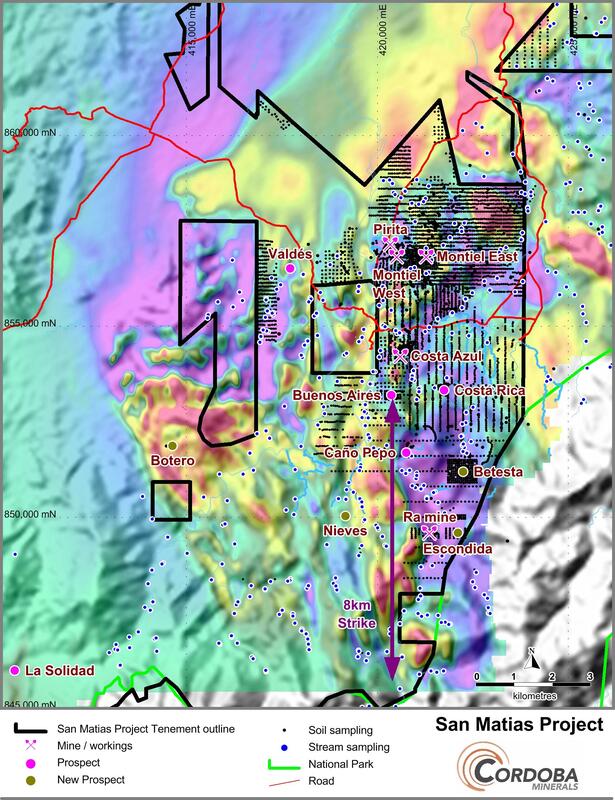 The newly discovered San Matias Copper-Gold Project comprises a 26,000 hectare land package on the inferred northern extension of the prolific and richly endowed Mid Cauca Gold Belt where recent drilling by AngloGold intersected 810 metres at 1.65% Cu and 0.78 g/t Au. The project area contains several known areas of porphyry copper-gold mineralization, copper-gold replacement or skarn style and vein hosted gold-copper mineralization. Porphyry mineralization at the San Matias Project incorporates high-grade zones of copper-gold mineralization hosted by diorite porphyries that contain strong potassic style alteration and various orientations of sheeted and stockwork quartz-magnetite veins with chalcopyrite-bornite mineralization and minor zones of K-feldspar within vein margins and secondary biotite. Lesser calc-sodic alteration is also noted as trace actinolite and albite alteration zones, largely in basaltic wallrocks and inclusions. At least one later phase of chalcopyrite veining overprints the sheeted and stockwork quartz-magnetite veins. A second, more felsic intrusive mineralized phase has also been identified which contains lesser quartz-magnetite veining associated with chalcopyrite and pyrite and a more well developed dissemination of chalcopyrite-pyrite. Potassic alteration, as secondary biotite, is well developed along with minor zones of chlorite-epidote alteration. Within the diorite porphyry, zones of intense sheeted quartz veining often reaches over 90% replacement of the intrusive host rock associated with strong potassic alteration and copper-gold mineralization. The nature of mineralization and related alteration encountered at Montiel is similar to those of other large and elite high-grade copper-gold porphyry deposits. The technical information has been reviewed, verified and compiled by Christian J. Grainger, PhD, a Qualified Person for the purpose of NI 43-101. Dr. Grainger is a geologist with +15 years in the minerals mining, consulting, exploration and research industries. Dr. Grainger is a Member of the Australian Institute of Geoscientists and Australian Institute of Mining and Metallurgy. Results from RAB drilling are not permissible for the purpose of NI 43-101 resource estimates. All samples have been prepared and assayed at SGS laboratory in Medellin, Colombia with gold assays being carried out as 50 gr Fire-Assays with AAS finish and all trace elements and base-metals being assayed using 4 Acid Digest with ICP-MS finish. The AuEq values have been calculated using a US$1,200 per ounce gold price and US$3.00 per pound copper price. The company utilizes an industry-standard QA/QC program. HQ and NQ diamond drill-core is sawn in half with one-half shipped to a sample preparation lab. The remainder of the core is stored in a secured storage facility for future assay verification. Blanks, duplicates and certified reference standards are inserted into the sample stream to monitor laboratory performance and a portion of the samples are periodically checked for assayed result quality. Cordoba Minerals Corp. is a Toronto-based mineral exploration company focused on the exploration and acquisition of copper and gold projects in Colombia. 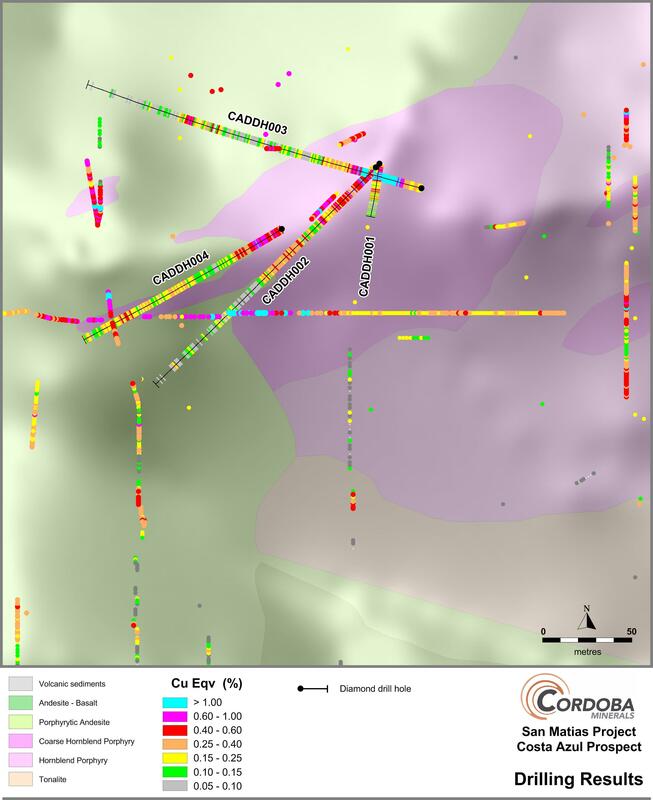 Cordoba currently owns 100% of the highly prospective San Matias Project located near operating open pit mines with ideal topography in the Department of Cordoba. For further information, please visit www.cordobaminerals.com. Cordoba has retained the services of Renmark Financial Communications Inc. to handle its investor relation activities. In consideration of the services to be provided, the Company has agreed to pay a monthly retainer of $7,000 that is renewable on a month-to-month basis. Renmark Financial Communications does not have any interest, directly or indirectly, in Cordoba Minerals Corp. or its securities, or any right or intent to acquire such an interest. This news release includes certain "forward-looking information" within the meaning of Canadian securities legislation. Forward-looking statements include predictions, projections and forecasts and are often, but not always, identified by the use of words such as "seek", "anticipate", "believe", "plan", "estimate", "forecast", "expect", "potential", "project", "target", "schedule", budget" and "intend" and statements that an event or result "may", "will", "should", "could" or "might" occur or be achieved and other similar expressions and includes the negatives thereof. All statements other than statements of historical fact included in this release, including, without limitation, statements regarding the potential of the Company's properties are forward-looking statements that involve various risks and uncertainties. There can be no assurance that such statements will prove to be accurate and actual results and future events could differ materially from those anticipated in such statements. Forward-looking statements are based on a number of material factors and assumptions. Important factors that could cause actual results to differ materially from Company's expectations include actual exploration results, changes in project parameters as plans continue to be refined, future metal prices, availability of capital and financing on acceptable terms, general economic, market or business conditions, uninsured risks, regulatory changes, delays or inability to receive required approvals, and other exploration or other risks detailed herein and from time to time in the filings made by the Company with securities regulators. Although the Company has attempted to identify important factors that could cause actual actions, events or results to differ from those described in forward-looking statements, there may be other factors that cause such actions, events or results to differ materially from those anticipated. There can be no assurance that forward-looking statements will prove to be accurate and accordingly readers are cautioned not to place undue reliance on forward-looking statements which speak only as of the date of this news release. The Company disclaims any intention or obligation, except to the extent required by law, to update or revise any forward-looking statements, whether as a result of new information, future events or otherwise. Bulk intervals are calculated using a 0.3 g/t AuEq cut-off with a maximum of 3m of internal dilution. Intervals are calculated using a 0.3 g/t Au cut-off with no internal zones of dilution from 3 metre composite samples. * denotes mineralization is open down-hole.